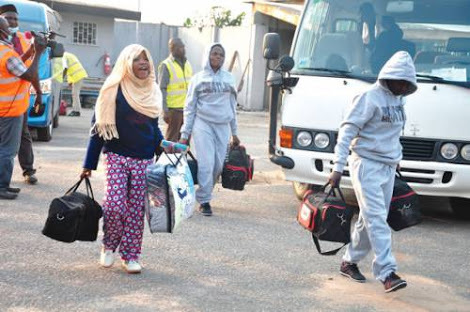 About forty (40) Nigerians were again yesterday evening deported back to Nigeria from Italy for immigration and criminal offenses. The deportation came four days after the British Government deported 23 Nigerians for similar offenses. The latest deportees from Italy comprising males and females were flown back to Nigeria through the Murtala Muhammed International Airport (MMIA) around 8:25pm. According to an immigration official, 39 of the deportees were returned because of immigration offences while one, a male was returned because of his involvement in drug related matters. The deportees were brought into Nigeria aboard a chartered Air Meridiana aircraft with the registration number E1-FNU. The immigration source said that the returnee with drug related issues would be handed over to police for further prosecution while 39 others were profiled by the officials of the Nigerian Immigration Service. The deportees who were looking frustrated were however prevented from speaking to the media by some security officials at the airport.